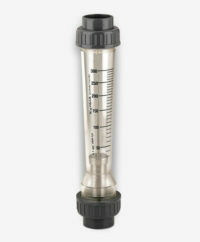 The Kytola Model HT flow meter is a durable, low-cost component that has been designed for use in industrial settings, such as chemical and process industries, agricultural applications and water treatment plants. It offers good corrosion resistance and has the option of having a low and high flow alarm if required. The Model HT variable flow meter has an injection-moulded, impact-resistant flow tube with easy to read scales that can be customised to suit alternative liquids and gases. It can be used for a large variety of flow ranges comprising of liquid or gas. Similar products include the Model HV. Contact our team on +44(0)1825 764737 to place an order. For a full overview of the technical specifications please click here. * Available as a special construction – please speak to our team to discuss your requirements.